We’ve put out a call to all BAGSC members that attended the ASBA conference to post their impressions and any images. We’ll post them as they arrive. Keep writing and reading. If you have any questions or comments about techniques, please post them by clicking on “leave a comment” at the top of this article. Feel free to ask participants to give a demonstration of what they learned at a BAGSC quarterly meeting. 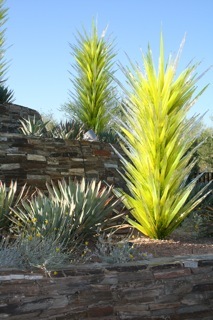 Chihuly glass plants at the Desert Botanical Gardens, photo by Arillyn Moran-Lawrence. The ASBA conference in Scottsdale, AZ, was my first and I was very impressed. Everything was very well organized and ran smoothly, except for one bus that broke down on the way to the museum exhibition. From the portfolio sharing, the luncheon meeting, the Legacy gallery show, the Techniques Showcase, the Phoenix Art Museum exhibition and the creative hors d’oeuvres and dessert that was presented by the museum, all were exceptionally well done. The workshop that Elaine Hultgren presented was “The Illuminated Desert”. Prior to the workshop, I learned about sources while purchasing many intriguing items from a NY company. I traveled with my expensive piece of vellum and small dab of 24k gold right next to my side. We chose a desert flower, then a capital letter style relating to the genus of the flower and sent that information on to Elaine. On arrival she had prepared a portfolio for each of us so that we could begin work immediately. We designed the desert flower design around the chosen letter and transfered it to the vellum. We learned to make “skins” of paint to use in painting on the vellum, how to apply the gold and burnish it, and how to draw a ” line” of gold. The workshop was only 7 hours long and most of us did not finish the project, however Elaine has asked us for our finished illumination and she will then send us a slideshow of all of our work. Portfolio Sharing. 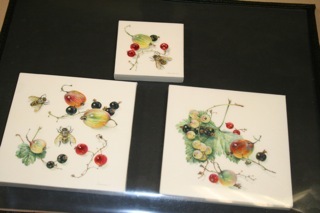 Kelly Leahy Redding, her framed vellums and her Artist in Residence Book from her trip to Italy. Photo by Arillyn Moran-Lawrence. M. Alice Rezende, Brazilian recipient of a Margaret Mee Fellowship to paint endangered species in the Amazon. 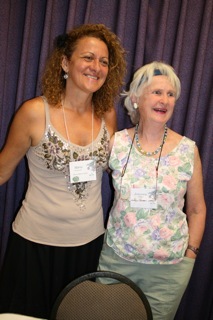 Shown with Jenevora Searight, from England, who lived in Brazil for 30 years and worked with Margaret Mee. Photo by Arillyn Moran-Lawrence. 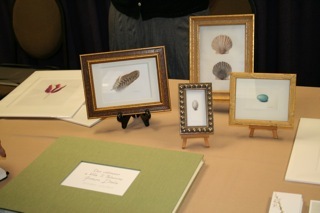 Jean Emmons fascinating work on vellum. Photo by Arillyn Moran-Lawrence.